Seeds are alive and therefore do not have unlimited life and germination capacities. They also vary as regards how long they can be stored. Due to their low moisture content metabolic activity in the seed is greatly reduced. Only gradually are the reserve substances broken down through respiration. Low temperatures, dry surroundings and the exclusion of air during storage reduce metabolic activity and maintain germination capacity for a period of time that depends on the type of seed. Tomato seeds for instance will still germinate after ten years, oily seeds such as those of the brassica family lose their germinating capacity very slowly while with members of the onion family it declines relatively fast. At Bingenheimer Saatgut AG the seed is mostly stored at a temperature of 15 °C and at 30 % air humidity. More sensitive species are stored at a temperature of 8° C and 35 % air humidity. In order to maintain the germinating capacity of each species, the dry seed should as far as possible be kept in airtight containers in a cool and dark place. Seed packets are best stored in thick glass jars or storage containers with tightly closing lids. If the seed is to be stored for a longer period a sachet of silica gel can be put in with it (silica gel can be obtained from chemists and drug stores) to absorb moisture. If it is heated to 80 – 100° C, the gel can be dried out and used again. For those with the equipment, the seed can also be vacuum packed and stored in a dark box. There is no legal requirement to provide a best-before-date in relation to seeds. If however such a date is given, those marketing them are responsible for ensuring that the seeds do in fact meet the legally determined minimum germination rate until that date. Germination rate depends however to large extent on how the seeds are stored. We cannot therefore provide any long term guarantee of their germinating capacity. From our point of view therefore providing a best-before-date seems to make little sense. 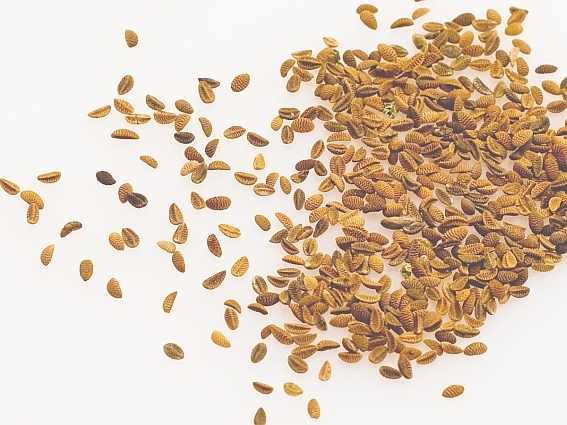 If you have been able to create good storage conditions for your seeds you can make use of our online service to check the germination rate of your batch of seeds. We test the germinating capacity of every batch of our stored seed again before packing it. If you have some seed over from the previous year, you can check it against the results of our seed diagnostics department by entering the batch number. You will find the batch number on the back of your seed packet (e.g. 07252/C). Up-to-date germination test results are being continually updated and posted online. This takes you to the relevant page: Checking the germination rate of my seeds. Having a batch number is a legal requirement. It allows us to provide unbroken traceabilty back to the producer. The letter at the end of of the batch number indicates the year in which the seed was packed. All the seed stored with us is systematically tested and the current germination rate determined. In accordance with seed marketing regulations the year in which the seeds were packed or the last germination test was carried out, must be printed on the packet. Other aspects such as recommended shelf life are voluntary. Apart from the batch number, Bingenheimer Saatgut AG also prints the year of packing and the letter coding. On our mono-chrome packets which have a variety label is attached, the year of packing is given as a number (e.g. '15' for the season 2014/2015) directly after the batch number. Is 100 % germination possible? In nature not all the seeds produced by a plant will germinate. There are flower species for instance for which a 65% germination rate would be a real achievement. There are very few species that reach more than 90%. It is the case with all seeds however that optimum storage conditions will ensure that the best possible germinating capacity is maintained. It is amazing how some species actually germinate better after being stored. The principle however is that if there is too much metabolic activity going on during storage, the germination rate declines. For this reason it is important to choose a suitable place for storing your seeds at home or in the garden. You will find storage tips here: The best way for you to store seeds at home.